For other towns of this name, see Cookstown (disambiguation). Cookstown's famous main street (laid out from c.1735–c.1800), is 1.25 miles (2.01 km) long and 135 feet (41.15 m) wide, one of the longest, and widest in Ireland. The main street, looking north. Slieve Gallion is in the background. The lands around the present site of Cookstown were, prior to the early 17th century, in the hands of the O'Mellan Clan and were broadly known as "Mellanagh". This land was confiscated by King James I after the Flight of the Earls of Tyrone and Tyrconnell in 1607 and a series of Rebellions in the area which saw the native landlords ousted from their holdings. The O'Mellan land was held to be the property of the Established (Anglican) Church and was thus presented to the Anglican Archbishop of Armagh who was charged with overseeing the settlement of the area with English and Scots "planters". In 1620, a small portion was leased by James Stewart (a Scots settler in the area) and lands around the townland of Corrcreagh (Irish: Cor Criche) were leased to an English ecclesiastical lawyer, Dr Cooke, who fulfilled the covenants entered in the lease by building 10 houses on the land (today covering the area known as Oldtown), which he stipulated were all to have front gardens (a tradition which still remains in place). In 1628, King Charles I granted Letters Patent to Cooke permitting the holding of a twice-weekly market for livestock and flaxen goods. In 1641, the native Irish revolted against the Planters in a bloody rebellion. Cookstown, being in the heartland of Ulster insurgency, was abandoned to the rebels who immediately seized the important Iron works at Lios Áine (later Lissan), and the area became a hotbed of activity since weapons such as pikes were forged for the rebel cause. Lissan was one of the first estates in this area to be settled when it was purchased by Sir Thomas Staples of Yate Court near Bristol in 1610. Sir Thomas' wife Charity, Lady Staples (by then a widow) and their five children were captured during the Rebellion by Hugh Og O Quin. Imprisoned in the castle at Moneymore 5 miles away,they were held there and later at Castlecaulfield until Moneymore and the estate were liberated by the Royalist army in 1643. When the armies of Charles I reached Cookstown in 1643, they routed the rebels and razed the town to the ground. The 1641 Rebellion had a devastating effect on the town and development ceased for nearly a century. Over the succeeding years, the lands around Cookstown were progressively bought up by William Stewart of Killymoon until in 1671 all of Dr Cooke's lands were in the hands of the Stewart family. Settlement however remained sparse and by 1734, only 2 inhabited houses remained at Oldtown. William Stewart and later his son James set out plans for the town soon after this. Inspired by the Wide Streets Commission's work in Dublin, they planned a new town to be built along a tree lined boulevard 135 feet wide which would connect the Killymoon Demesne with Oldtown, a distance of over a mile and a quarter. This street was laid out by the mid-1790s and has remained at the centre of Cookstown's development ever since covering Killymoon Street, Church Street, Chapel Street, Loy Street, William Street, James Street Oldtown Street and finally Milburn Street and being the longest main street in Ireland. All remaining traces of Cooke's town were obliterated at this point. Throughout the remainder of the 18th century, Cookstown prospered quietly as a market town where linens, seeds and other agricultural produce were marketed at its famous market. In 1802, Col William Stewart (James Stewart's unmarried son) approached the famous London architect, John Nash and requested that he visit the area to rebuild the Castle of Killymoon which had been burnt in 1801. The Castle was built in just over a year at a cost of £80,000 and was Nash's first Irish Commission. It is two stories high and has two large towers to the East and West, one circular the other (slightly lower) octagonal. Parts of the original castle were retained and its former Chapel became Nash's library. In addition to Killymoon, there is evidence to suggest that Nash also designed the original St Luran's Parish Church on Church Street in 1822 and certainly plans for the church exist in his hand. It is also suggested that Nash designed the dower house of Killymoon on Chapel Street (now divided into two houses) and it is certain that he designed the Rectory at Lissan for the Rev John Molesworth Staples in 1807. However, Cookstown's greatest development came with the Industrial Revolution. With the establishment of Gunning's Linen Weaving Mill, the expansion of the Wellbrook linen finishing estate, the establishment of Adair's weaving mill at Greenvale and the final arrival of the railways, Cookstown's population quadrupled between 1820 and 1840. The railways allowed the fast transport to and from the town of agricultural produce. Two railways established terminus railway stations at Cookstown - the London, Midland and Scottish Railway in their dressed stone station designed by Charles Lanyon (now much altered as a Chinese restaurant on Molesworth Street) and the Great Northern Railway in their brick station next door (now Cookstown High School's Hockey Club). Both transported goods and livestock for sale to Cookstown's market. With the exception of Killymoon Castle, all of Cookstown's best architecture dates from this period and the town still resembles almost exactly the town developed at this time. Probably foremost among the buildings of this period is J.J. McCarthy's Church of the Holy Trinity on Chapel Street which is one of McCarthy's earliest commissions in which the influence of AWN Pugin's St. Giles' in Cheadle can be ascertained. Other fine buildings of this period include the Scottish Baronial former Courthouse (currently derelict) on Chapel Street; the Classical First Presbyterian Church (Loy Hill) and Italianate Molesworth Presbyterian Church (Molesworth Street); the Romanesque Methodist Church (Church Street); the Hibernian Bank on James Street and the pair of railway termini on Molesworth Street. With the linen and later the hat-making and brick manufacturing industries, Cookstown continued to prosper in the early 20th century and its population continued to expand. Little architecture of any note dates from this period as the Victorian structures of the previous generation continued to fulfil their purpose. World War I had a devastating effect on the local community at a cost of life commemorated in the prominent Cenotaph (loosely based on Lutyens' Whitehall Cenotaph) at the centre of the town unveiled in 1927. This is Cookstown's sole piece of public sculpture. On 17 June 1920, during the Irish War of Independence, the Irish Republican Army (IRA) attacked the Royal Irish Constabulary (RIC) barracks in Cookstown. It is claimed that some RIC helped the IRA in the attack. However, it failed and one IRA volunteer was killed. As industry developed, a Technical College was established on Loy Hill in a Queen Anne style red brick structure. This was opened by Mrs. Adair, whose husband owned the Greenvale Mill, in 1936 and the building continued as a Technical College until 2006 when it was relocated. Currently it is used as offices, a creche and a credit union. All of Cookstown's main educational institutions date from this period, Cookstown High School being housed in the Victorian mansion and former residence of the Gunning family at Coolnafranky and the Catholic Church constructing its convent schools and St Mary's Boy's School in 1939 (now demolished and replaced by Holy Trinity Nursery School), all on Loy Hill. With the outbreak of World War II, Cookstown became the centre of much regimental activity. Later, Killymoon was requisitioned by the United States Army, and a large [internment camp] was established at Monrush, where German prisoners of war were interned. Cookstown suffered no enemy damage during the war and the town's industries prospered. However, this proved to be the last industrial belle époque of Cookstown. While the linen industry survived in Ulster until well into the 1960s, increased fabric imports from the Far East led to economic difficulties across Northern Ireland. Despite this, Cookstown's Council built a modern town hall in 1953 (now demolished and replaced by the Buranavon Theatre) and the Daintyfit clothing factory on Burn Road opened. An internationally renowned Agricultural College was established at Loughry House, but the town's prosperity was now in doubt. Gunning's weaving mill closed in 1956, and was followed by Adair's Mill and the Wellbrook estate in 1961. The railways ceased to operate in 1963, and while the market continued to be held each Saturday, its agricultural significance never recovered and the sale of livestock completely ceased in 2004. In 1970, the Blue Circle cement factory opened at Derryloran. This provided employment for the local population. The sole remaining building of architectural note from this period was Liam McCormack's Chapel, a cube-shape tacked onto JJ McCarthy's High Victorian Gothic Convent of Mercy at Chapel Street. The patterned concrete and bronze façade was constructed in 1965 and contains important stained glass by Dublin artist Patrick Pye, though the building is currently boarded up following the closure of the Convent. Through most of its history relatively good relations between Protestants and Catholics were maintained by almost equal numbers from both communities. But during the Troubles, Cookstown suffered from several bomb and other attacks, robbing the town centre of most of its Victorian buildings including the sandstone façade of the Hibernian Bank as well as the Adair's former Italianate residence at Glenavon (which had been converted to a hotel). In 1989, two permanent armed checkpoints were erected at either side of the town centre to protect an already existing army base at Chapel Street. Barriers were also erected around the town so that the Main Street could be cordoned off in the evening. These checkpoints were finally removed from the town in 1996. In 1994 the tree-lined boulevard thought up by James and William Stewart was restored and a scheme of regeneration saw the creation of green space, flowerbeds and restored shop frontage. The tree-lined boulevard is the basis of the towns fantastic festive Christmas lighting. With Ulster's industry now substantially defunct, the town began to attract instead financial investment from shopping and tourism. In 2000, the Burnavon Arts and Cultural Centre opened on the site of the former Town Hall on the Burn Road and began to attract large scale cultural and artistic events to the town whilst a year later, a development scheme began which saw the former LMS Railway Terminus turned into a retail park. In 2003 Cookstown District Council in conjunction with Cookstown Town Centre Forum launched Cookstown's ten-year Town Centre Regeneration Strategy and Action Plan which details a range of short, medium and long range regeneration actions. Today[when? ], Cookstown has been almost completely regenerated with plans for further regeneration work to be carried out throughout the town centre. Another large retail and office development on Molesworth Street was built in 2007 on the site of the former Market Yard. The old Gunning and Moore Weaving Mill at Broadfields has been transformed into a retail park. Plans were also passed for two more major retail and residential/ penthouse developments in the Orritor Street/ Burn Road area of the town. Further development is planned for the site of the former Daintyfit factory. The town's central location and many hotels (for a population of just over 11,000 it has no less than 4) has meant that it is a location for conferences and meetings involving delegates from across Northern Ireland. It was the location for the Mid-Ulster Sports Arena (established in 2003) and the now cancelled planned Northern Ireland Community Safety College to accommodate the Police Service of Northern Ireland, Northern Ireland Fire & Rescue and the Northern Ireland Prison Service. Cookstown currently has more than a hundred types of businesses. Of the direct retailing businesses some two-thirds are independent, largely family-owned concerns which give the town's retailing a distinctive appearance. The town has taken a long term view to regeneration and Cookstown District Council in conjunction with Cookstown Town Centre Forum appointed a Town Strategy Manager to implement Cookstown's Town Centre Regeneration Strategy. Cookstown bills itself as the ‘Retail Capital of Mid Ulster’, through a brand identity (Cookstown – Looking Good, Looking Great) and aggressive marketing of the town locally and nationally. The town was also one of the first in Northern Ireland to produce a ten-year Urban Design Strategy (2007), an aspirational framework for all future town centre development. The Cookstown Town Centre Living Initiative (LOTS) Scheme (2006–2011) offers substantial grant assistance to reinvigorate unused or derelict space above shops into modern residential living accommodation is considered to be one of the most successful schemes of any town in Northern Ireland. The Cookstown Town Centre Street Entertainment Programme (2008–present) promotes the town's family-friendly appeal and encouraging people either to visit for the first time or to prolong a regular visit. While in late 2009 the civic heart of Cookstown, the Burn Road has benefited from an Environmental Improvement Scheme and now hosts outdoor events including the Cookstown Comedy Festival. Cookstown District Council have continued to invest in the town, opening the Davagh Forest Trails- one of just 3 high spec mountain biking trails in Northern Ireland - in 2013. Cookstown's main street hosts an open-air market each Saturday. The annual Cookstown 100 National Road Race is a motor biking event attended by many motorbiking enthusiasts. It is the opening race of the road racing calendar in Ireland and is usually held in April. Ardboe High Cross and Abbey (Seanchrois Ard Bó agus Ministir Naomh Colmán), one of the best examples of a 9th/10th century High cross in Ireland, is 10 miles from Cookstown. 22 panels illustrate stories from the Old Testament and the New Testament of the Bible. Other ancient sites nearby include Beaghmore stone circles and Tullyhogue Fort (beside the village of Tullyhogue), the inauguration site of the chiefs of Tyrone (Tir Eogain), the O'Neills. Destroyed in 1602, the fort was salvaged to some degree in 1964, when the site was cleared and presented. Though none of the original buildings remain, the unusual layout (raised inner mounds, but no outer defensive ditch) is still clearly visible. Tullaghogue is now owned and maintained by the Northern Ireland Environment Agency (N.I.E.A.). The Donaghrisk walled cemetery to the southwest of (and clearly visible from) the fort is the resting place of the O'Hagans, the chief justices of Tyrone (and as such, they presided over the inauguration ceremonies of the O'Neills). Lissan House lies on the outskirts of Cookstown. It is a huge structure of little architectural beauty but enormous historical significance and was, until the death of its last inhabitant, Hazel Radclyffe Dolling (daughter of the 13th Baronet of Lissan, Sir Robert George Alexander Staples), in 2006, the oldest domestic dwelling in Ireland continually inhabited by one family. The entrance front is dominated by a gargantuan porte-cochère built in about 1830. Inside, the most striking feature is the bizarre and gargantuan oak staircase which rises from the stone flagged entrance hall the full height of the building. This was constructed by a local carpenter from the remnants of a rare 17th century staircase which collapsed (along with the floors between it) as a result of dry rot in the 1880s and is quite unique, having flights springing at every conceivable angle, some of which go nowhere. The other most notable feature of the house is its octagonal ball room added by Sir Thomas Staples (Queen's Advocate in Ireland) in about 1830 with its fine restrained neo-classical plasterwork, Dublin chimneypiece and carved door frames. The house has recently undergone extensive renovation work externally and is open to the public for tours, events and is a licensed venue for civil partnerships. Further work is planned, including the rebuilding of the glass conservatory, refurbishment of outhouses and gardens and other general works to restore the demesne to its former glory. It is run by a Trust was established on the death of Mrs. Radclyffe Dolling to oversee the restoration of the house and its development into accommodation and conference facilities. Killymoon Castle is about 1.5 kilometres (0.93 mi) south east of Cookstown. This imposing structure is regarded as Cookstown's finest piece of architectural heritage. It was built in just over a year at a cost of £80,000 and was Nash's first Irish commission. It is two stories high and has two large towers to the East and West, one circular the other (slightly lower) octagonal. Parts of the original castle were retained and its former Chapel became Nash's library. Inside the dramatic entrance porte-cochère can be found a return staircase leading to the octagonal drawing room and oval dining room. The Stewarts sold the castle in 1852 and, after passing through the hands of some 6 owners, it was sold for the final time in 1922 to a local farmer for the princely sum of £100. The same family retains it to this day. Drum Manor, approximately 5 miles from the town. Alexander Richardson, a burgess from Edinburgh, Scotland, bought the estate of Craigbalk in 1617 and built Drum Manor, which was also known Manor Richardson. Alexander's son Sir William Richardson left it to his second son, Alexander, from which the Richardsons of Drum descend. Sir William's third son, William, who inherited lands near Augher, obtained a lease for lands in the townland of Tullyreavy on the Drum Manor estate, where he built a house by the lake known as Oaklands. In 1868 Viscount Stuart (later the 5th Earl Castle Stewart) married Augusta Richardson-Brady, heiress to the Oaklands Estate. Immediately upon marriage, Lord Stuart set about reconstructing Oaklands into the Tudor revival Drum Manor. This battlemented sandstone structure once had a tall tower to the East near the entrance front which was dominated by a huge entrance portal surmounted by a large tracery window which contained Victorian armorial stained glass. Lord Stuart was also responsible for setting out the formal gardens and demesne which survive to this day. Lord Stuart's grandson sold the estate to the Forest Service in 1980 and the Service set out the woodland habitat that exists today. However, in an attempt to avoid incurring rates liability, the Forest Service decided to demolish the Manor. Today, Drum Manor Forest Park is one of Cookstown District's largest tourist attractions (complete with the highest-rated caravan site in the District) but only the ground floor outer walls and the east tower of the Manor House survive. St Luaran's Church of Ireland Church on Church Street is thought to have been originally constructed in 1822 by John Nash and certainly plans for the church exist in his hand. However, even if Nash's church was completed, at most only the tower and first bay of this structure have survived Victorian extension by the architect Welland in 1859. Nash's plans show a castellated and battlemented church from which only the tower and spire bear any resemblance to the structure standing today. The interior is a typical Victorian church structure with a chancel arch, hammer beam roof and large sanctuary with sparse but dignified decoration. James Joseph McCarthy's Catholic Church of the Holy Trinity was constructed between 1855 and 1860 with a tower and spire at the East End. It is one of McCarthy's earliest works in which the influence of A. W. N. Pugin is apparent and the later florid French Gothic of his latter years (seen in St. Patrick's Dungannon and St Macartan's Cathedral in Monaghan) is nowhere to be seen. The church is constructed in the Early English style with a nave of 5 bays leading to a chancel arch and reduced chancel area beyond. In 1980 during the re-ordering works carried out in the aftermath of the Second Vatican Council, the caen stone side altars, marble altar rails, carved pulpit, original high altar and Telford Pipe Organ were removed. Only the gargantuan Caen stone reredos survives (minus its central spire and High Altar) behind one of the reclaimed Caen stone and Carrera Marble altars, the front of which bears a carved representation of the Assumption of the Virgin (presumably formerly in the Lady Chapel which would have been to the right of this space). The crowning feature of the church today is the Western Window. This was designed and manufactured by Hardman of Birmingham (a firm employed and partly run by A. W. N. Pugin) and has representations of the Canonized Bishops and Abbots of the Archdiocese of Armagh around a representation of the Virgin crowned in glory and below a tripartite window representing the constituents of the Holy Trinity. The remaining stained glass is mainly by Mayer of Munich and dates to the end of the 19th century though there is a very fine Art Deco window showing the Annunciation in the style of Harry Clarke in the former Lady Chapel (now the baptismal font area). The Church underwent a multimillion-pound renovation in 2010-12 which included an extensive renovation and refit inside the Church, including restoring the marble floors, altar and upgrading electrical and sound systems, as well as major conservation and preservation work on the church exterior and windows. In elections for the Westminster Parliament and the Northern Ireland Assembly it is part of the Mid Ulster constituency. 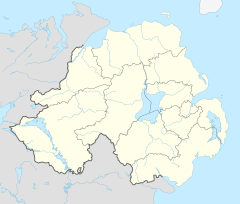 The local authority, Cookstown District Council, was established in 1973, and included part of County Londonderry, notably the villages of Moneymore, The Loup and Ballyronan. As part of the Local Government Reform (NI) Cookstown District Council merged with Dungannon and South Tyrone Borough Council and Magherafelt District Council to form a larger Mid-Ulster District Council in 2015. Oliver Sheppard (1865-1941) - sculptor, born in Cookstown. His The Dying Cú Chulainn piece was chosen by Éamon de Valera as the national memorial to participants of the 1916 Rising. The statue is located in Dublin General Post Office. Jonathan Swift - stayed at Loughry Manor as a guest of the Lindsay family while writing Gulliver's Travels (published in 1726). Nick Laird - poet and novelist. Eamonn McCrystal - singer and broadcaster. Owen Mulligan - Tyrone GAA footballer, won three All Irelands with Tyrone in 2003, 2005 and 2008. William Craig - politician, founder of Ulster Vanguard, born in Cookstown. Bernadette Devlin - Republican Socialist political activist, raised in a small housing estate called Rathbeg, one of the leaders of 1960s civil rights movement, youngest woman ever to be elected to the British parliament, aged 21. This record stood until 2015. Major-General Sir Richard Havelock Charles, 1st Baronet (1858–1934) - medical doctor, Serjeant Surgeon to King George V.
Mary Mallon, aka Typhoid Mary. Michael Owens, aka Doya - Enjoys screaming at children and picking fights with everyone. Maximum speed is 0.1 m/s. Johhny Bounce - "There some muscles Johnny"
Cookstown Hockey Club, are the local field hockey team. Cookstown Fr. Rock's are the local Gaelic Athletic Association club. Coagh United F.C. and Sofia Farmer F.C. are football clubs in the Cookstown District that play in the Ballymena & Provincial Intermediate League. On Census Day 2011 in Cookstown District Electoral Area, there were 22,838 people (99.08% of the usually resident population) living in 8,304 households, giving an average household size of 2.75. 21.42% were aged under 16 years and 13.28% were aged 65 and over; 49.58% of the usually resident population were male and 50.42% were female; and 35 years was the average (median) age of the population. 99.02% were from the white (including Irish Traveller) ethnic group; 58.28% belong to or were brought up in the Catholic religion and 38.05% belong to or were brought up in a 'Protestant and Other Christian (including Christian related)' religion; and 37.89% indicated that they had a British national identity, 32.54% had an Irish national identity and 31.34% had a Northern Irish national identity*. The Loughry Campus of the College of Agriculture, Food and Rural Enterprise is two miles south of Cookstown. The first community hub for primary care in the province is to be established in the town, backed by four local GP practices and the health board. It is to incorporate scanning facilities, a minor surgery suite, a pharmacy, out-of-hours consultations and community healthcare partnerships, with the possibility of developing supported living accommodation for older people. The townland is situated in the historic barony of Dungannon Upper and the civil parish of Derryloran and covers an area of 217 acres. ^ "Tyrone Vintage Photographs" Archived 10 July 2011 at the Wayback Machine. Emerald Isle Gifts. Retrieved 27 August 2012. ^ Hezlet, Sir Arthur (1972). The 'B' Specials. London: Tom Stacey. p. 10. ISBN 0 85468 272 4. ^ Chronology of Irish History 1919 - 1923 - June 1920 Archived 5 September 2007 at the Wayback Machine Seamus Fox. 2008. Dublin City University. ^ a b c Alexander Richardson, founder of the Drum estate. Ancestry.com user page. ^ "Northern Ireland Placenames Project". placenamesni.org. Archived from the original on 1 October 2010. Retrieved 2012-08-27. ^ a b "Census of Ireland 1891". Enhanced Parliamentary Papers on Ireland. Retrieved 22 March 2013. ^ "£8m health village plan 'well advanced'". Mid Ulster Mail. 9 May 2018. Retrieved 25 May 2018. ^ "Census of Ireland 1851". Enhanced Parliamentary Papers on Ireland. Retrieved 19 March 2013. Wikivoyage has a travel guide for Cookstown.